These potatoes make a great side dish or snack with your favorite dip. For St. Patrick's Day fun, add a few drops of green food color to ranch or French onion dip to serve with the potatoes. 1. Preheat oven to 450°F. 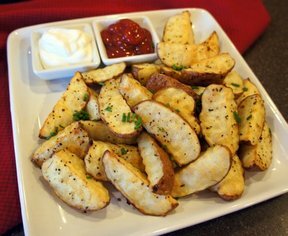 Cut potatoes into 3x1/2-inch wedges. Place in large bowl. Add oil; toss to coat well. 2. Mix chili powder and salt. 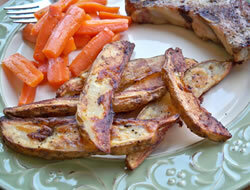 Sprinkle over potatoes; toss to coat evenly. Arrange potatoes in single layer on foil-lined 15x10x1-inch baking pan. 3. 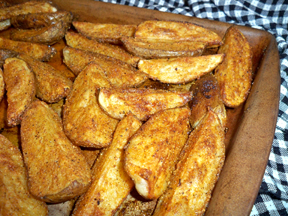 Bake 30 minutes or until potatoes are tender and golden brown.